1. Set people on fire. 2. Explode people and stun them. 3. Throw fire at people. 4. Drop fire on groups of people. done made Ellspeth (still hopins fer ta make the level cap fer the first time in over five years) a happier li’l belflock than all the rest combined. It is so much fun. SO MUCH. I don’t care if it’s simple, I’m like: YOU I BLOW UP YOU I SET ON FIRE FIRE FIRE FIRE. Dungeons? FIRE FIRE FIRE FIRE FIRE. Questing? FIRE FIRE KITE KITE FIRE. This is how it was supposed to be. The next series will be 31k words, all of them FIRE. FIRE FIRE FIRE. Is the fire pretty, oh so pretty? Does incinerate still zig-zag through the air before reaching its target? Is conflag still an instant bombshell and gloriously critty? Is that really chaos bolt in your picture, and if it is, can MISTS come out now, please? Still zigzaggy. Conflag is separate from Immo and I use it more as a stun, but it’s still instant. You can glyph it to have two charges but reduce the stun. That is really Chaos Bolt going to a Havoc’ed target. For a beginning player, this simplicity is awesome. Great series of posts. 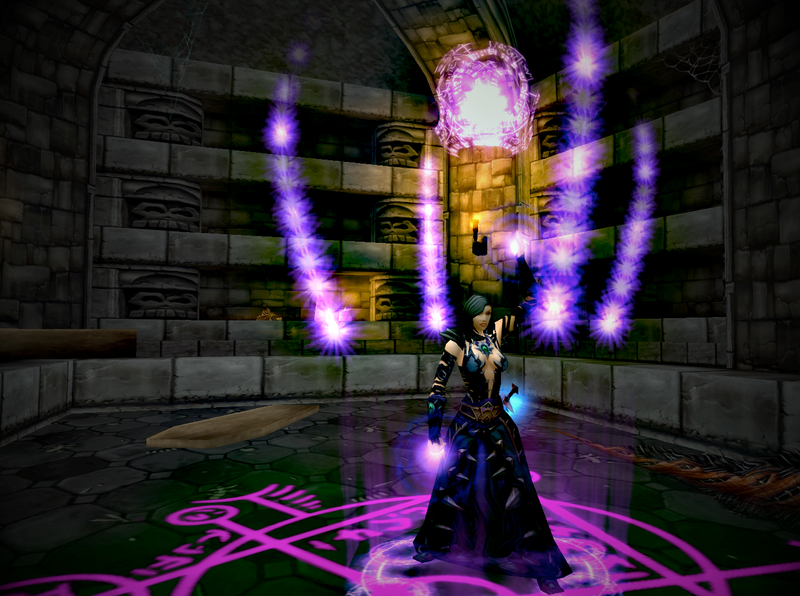 I still run my warlock main, and I actually kind of enjoyed the complexity of demo in early Cata, but they lost me when demon twisting came into the picture to get the best dps out of the spec. I still love the concept of demo, but I *hate* demon twisting with a fiery passion. So now it’s my soloing spec and I raid as affliction, but after reading this I’m really looking forward to trying out demo in the beta. It’s very different in the Beta. Very, very different. After getting six warlocks to max level, I didn’t think I had another one in me. Then I read Cynwise’s MISTS preview. I have a few more in me. Great post, Cyn. I haven’t been excited to play Mists until now. Hell, I’ve had beta access for almost a month and haven’t given a thought about installing. Curious, have they revamped the pet system in Mists? I stopped playing my warlock a while back when Demo started having to swap out pets constantly (single/multi target). Is this simplified also now? There doesn’t appear to be any reason to Demon Twist in the new model. I don’t know if DPS is exactly equal between the demons, but there aren’t abilities which make you say “use the felpup with Affliction and imp with Destro.” There’s more player choice now. What *would* influence pet choice, then? Whichever the theorycrafters tell us has the highest dps? I’d dearly love to be able to run around as destro with a felpup, but I fear getting locked into whichever demon increases my dps the most. Again. It’s either going to be DPS or utility. I hope DPS is equal and it’s solely ability/buff selection, because then it means actual flexibility in a group environment. But it might be DPS. Felguard is best for Demo and Felhunter for both Affiiction and Destro. Unfortunately, the way things stand, Grimoire of Service is the highest dps tier 6 talent. This is unfortunate given the cool new demonic minions available via Grimoire of Supremacy. 125% damage increase vs 110% damage increase over baseline damage (no tier 6 talents). I am sure raid boss fight mechanics will dictate use of other demons and Grimoires but for top damage their are no choices. 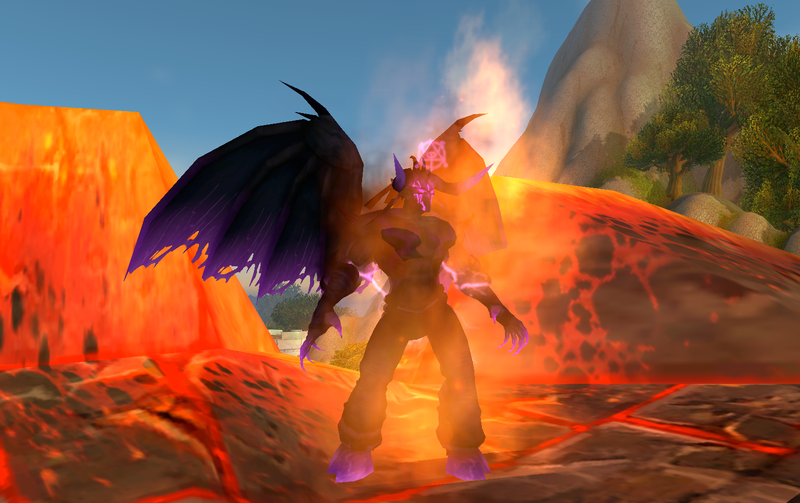 I don’t know how much lower other demons are (MoP beta simcraft just released a few days ago) at this point. Channeled spells use mana per tick and the return on health/mana used from Drain Life and harvest life are problematic. Thankfully Soul Harvest was just changed to restore shards. Also, are shards for added dps viia haunt or for utility? I don’t agree that we should have to choose. Demo: Meta form is pretty underwhelming as the highest dps comes from simply spamming demon slash, casting Doom and responding to Molten Core procs. Destro: Ember generation is painfully slow and required Rain of Fire to be cast as part of the single target rotation. Cynwise, how do you feel about a 4 second Chaos Bolt cast? Terrible for pvp and hard to cast on high movement raid encounters..
Other than those easily solved issues (hopefully), I love that the specs are now unique. I noticed that about Tier 6, I think that actually developed when I was playing? This is one reason I have shied away from balance details – I’m honestly confused at this point about what is in and what is out, and while I’m very excited about the changes and structure of the class, the execution of it, in fully-balanced play, will be where the class will live or die. It seems to be consistent that resources should be used for either DPS or utility. I know Shards and Embers work like that, I think Fury did. Does. Dagnabit. I think it makes for interesting gameplay to have that as an option, even if DPS gets chosen while raiding more often than not. Having options is important, not everyone is maximizing DPS all the time. The current model of only using resources for utility is terrible; I would like to see how it turns out. Affliction is totally resource starved. I attributed that to tuning and needing self-heals as part of the default. A spec should be self-sufficient without regard to talent or glyph choice. Demo should be a tank and needs work as a DPS. I think then the transition to the really simple melee fighter is fine, the new Chaos Buffet … blast… whatever it is helps but it still needs work. It’s better now than it was before. Destro is not burst but is rhythm. I think if Chaos Bolt hits hard enough the 4 second cast is okay, but because it’s a very different kind of spell than warlocks have have before. In PvP I would like to be able to have a spec that says, if you let me generate my Embers and then leave me free casting for 10 seconds, I want to be able to kill your entire team with Chaos Bolt and Havoc. In PvE timing these monsters will be part of the challenge of playing well – knowing when you can get them off, knowing when you can chain them with Havoc on adds, things like that. The one problem I really do see is Ember decay during a cast – if you start the cast, you should be able to finish it. This doesn’t always happen now. Would I like it as a 3 second cast? Sure. But if the damage is high enough, then a 4 second cast is totally workable. It’s just very, very different. In PvP I think Destro suffers not from CB but from a different problem – susceptibility to dispels and interrupts. 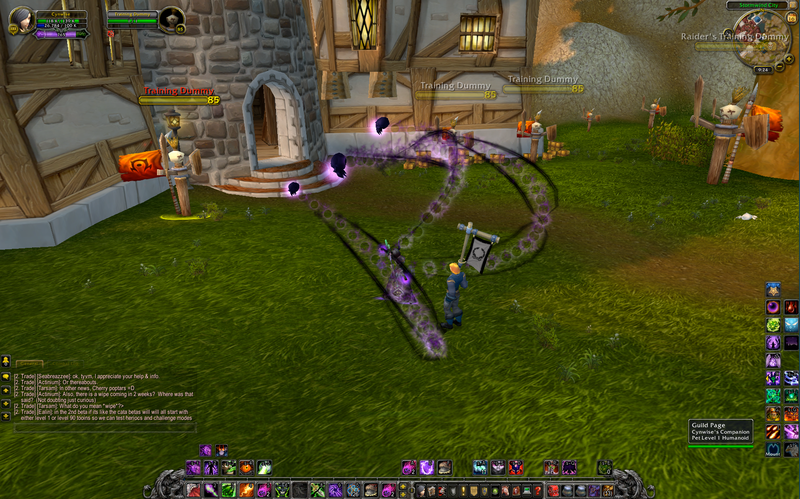 The dearth of instant-cast spells (Conflag and Fel Flame are it) means you’re going to get kicked a lot. Immolate will likely still be a problem, but FAR less of one than in the current incarnation. What’s strange is that I think Affliction will fall prey to some of this too – I see the spec as less mobile now than in Wrath/Cata due to the reliance on MG. Most of these things are fixable and tunable. I think the framework is improved and the direction is correct – now we have to see how things pan out with the final execution of things. edit: On affliction, we go from full health to dead in 103 seconds due to life tap without any talents, glyphs or dps-reducing self heals. Destro doesn’t have that bursty feel to it anymore? That’s sad-making news. It feels more like a crescendo than an initial burst. Leveling you have burst, but at endgame you build up to a massive explosion. I feel a comment on Hunter pets is relevant here. When we had various DPS abilities assigned to different pets, there was always a best pet, like cats, then later wolves. In Cata, all pets did the same base DPS, though there was a best pet spec (usually Ferocity, sometimes Cunning, never Tenacity), but that took second seat to bringing a missing buff. This is a fantastic pet system. Mists is making it even better by having pets able to respec. My point is, Hunter pets took a concept from Warlocks (pets bringing buffs) and ramped it up. Perhaps Demon design could reclaim that concept more fully. If you are wondering if you should level a Warlock now or in Mists, wait for Mists. I’m at the point now where I’ll be damned if I’m not going to see my way to L85 as a Affliction Lock via BGs. As much as I’m not so thrilled about the changes to Mages, this does look interesting. The real question is whether this is too little too late, as people may have given up on Locks entirely. I’m sorry! Many words had to be written to get to that point! Yeah, but I’ve been debating about what spec to be my primary in Mists. I think I’ll put my current mains in semi-retirement, like I did with Q for Cata, and start a new story. I’m not sure whether Adelwulf will become my new main or will share responsibilities, but we’ll see. We’ll see. I still say *every* class should have a tanking spec. I’d give ’em all healing specs, too, so anyone could play any role, if they are up to the task. I’d actually try out a Warlock if I could tank as one, just because I like the flavor of a spellcaster who “hulks out” to tank. …then again, I’d also let players respec their *class*, so I’m sort of out there. That you can change your appearance, race, gender, even faction – but not your class – baffles me so much in WoW. I get it from a game perspective, but not from an RPG one. If Blizzard ever gave warlocks a dps-to-heal spec (ala Rift’s Chloromancer), I would shoot rainbows out of my naval. This has me both excited and nervous for the expansion. I’m excited that so many changes (mostly positive) are happening to the class I love, but I am also terrified that I will hate playing it because of the many changes. Yeah, I’m with you on the nervous part. Mists could still have a Jar-Jar Binks moment lurking out there, and I’d really rather not have that awaiting us when the expac drops. Meesa no worried about dem gungans! This was an amazing series of posts that solidified my desire to try out the class. I’ve got a Dwarf Warlock rolled, on pause for AH and Banking duties, and I will be eagerly awaiting the release of Mists, as you suggest. In the meantime, I’ll be trying out a pre-made on the beta to get a taste of whats to come. I’m glad to see that you were able, at last, to end on an up note. I wish you much more Warlock joy in the future. I don’t know what the future holds for me and playing Warlocks. But at least I know I’ve said what I felt needed saying about them. Who knows? But if you’re enjoying it again, that’s a good start. 🙂 After all, that’s what this whole exercise was supposed to be about, right? After her birth as a Warlock in the later half of LK xpack, Nimaya of Windrunner has traveled many lands in her 2.5 yrs as my main toon. Cynwise, I did have doubts continuing my game play as a warlock while in this portion of Cataclysm but your time and efforts paid off renewing my love for a class and role. Thank you for taking the time to help us keep the faith while waiting to see where Warlocks will be in MoP. I’ve been saying that destro needs a, well, a “destruction” button (pve or pvp) for years lol. While demo has had that turn into demon thing that went with the soul of the class forever, destruction, while my favorite spec, has kinda fallen short on its namesake. I’ll miss the pride points of pulling top dps on a ridiculously complicated class, but if the new system gives that feel of barely being in control (do the embers still hurt you like they said they were gonna? ), and then releasing it in some sort of hell spawned super nuke(s)…. well that seems VERY destro-like. I’ll be sad to see the complexity for complexities sake leave (who doesn’t like to feel like the better player because they just destroyed (pun intended) their 10m fire mage or spriest or combat rogue on fights like staghelm in 4.2, or ultra in the current tier?). IF this spec generates that feeling of its namesake, then i for one will let go of my ego, and be happy with a different kind of complexity. I would gladly trade my pride for taking a class/spec that on average performs in the middle of the pack and making it shine for a spec that actually has some feeling to it, that feeling that “a live warlock = a dead everyone else” (the evil warlock guide). Because our dots were easily expelled, and we had no mana drain… but it didn’t matter because CONFLAGRATE CHAOS BOLT FIRE TO THE FACE! Also, just wanted to say thanks for making these posts cyn. I’ve been reading them as they’ve been posted since you started this saga, and it has changed my perspective of all things warlocky in MoP from gut-churning trepidation to a more positive outlook. I find it difficult to square the optimism in this post with the terror that seems to permeate the beta forums from locks. I’m not in beta, though – what’s the source of the complaining, really? The class needs to be better tuned from where it is now, and beta testers haven’t seen any changes there at endgame. Leveling as Destro is so much fun, though. I don’t know if enough people have tested that part of Beta out yet. The changes in Beta have, to a large extent, addressed the flaws of Cataclysm. Whether they address the challenges of Mists is an entirely different matter. Thank you Cynwise for such an intelligent and well thought out series. Thanks for this series Cyn. I’ve enjoyed reading it despite not being a warlock player. I haven’t read all of the comments, so this may have been mentioned. However, I feel that the gear issue could be solved by making spirit for demo tanks be the equivalent to agi for bear tanks. Currently locks don’t want the spirit gear so it wouldn’t be the same gear for dps and tank specs. Which, I believe, is a problem GC discussed in his shooting down of the idea of a demo tank. Currently, you have all priest specs interested in spirit gear, and the non spirit gear is shared between locks, mages and S-priests. Therefor, moving 1 lock spec to spirit gear shouldn’t create too many issues with the fighting over gear. Obviously, there are still other issues, but I would love if blizz made the demo tank move. I do wish demo tanking was in the cards. The gear itemization is actually quite easy….spirit = tanking stat. I’ve tossed that out on the forums to general lack of response for some time. As it stands now spirit cloth is the exclusive sandbox of priests which is somewhat smacks of favoritism since they get 2x the loot table of any other caster for all their specs. At the very least its a waste on par with spirit plate for only holy paladins. If spirit were 1 tanking stat, mastery is mastery (for all tank classes), then int did a avoidance conversion like agi (which already exists for ferals) you have all the same stats other tanks have. That is to say mastery + 2 avoidance stats. With spirit = tank stat for glyph’d demo you would have at least 2 classes using it and it would very clearly separate warlock tanking gear from dps gear. Sure you could crossover gear somewhat but plate dps and ferals all do that already with the same losses going the opposite direction so its hardly an outlier. That arguement of separate gear isn’t even valid since monks are tanking with their dps gear presently. What is most frustrating is that all the raw tools were there for a tanking spec, they just needed to tune numbers. 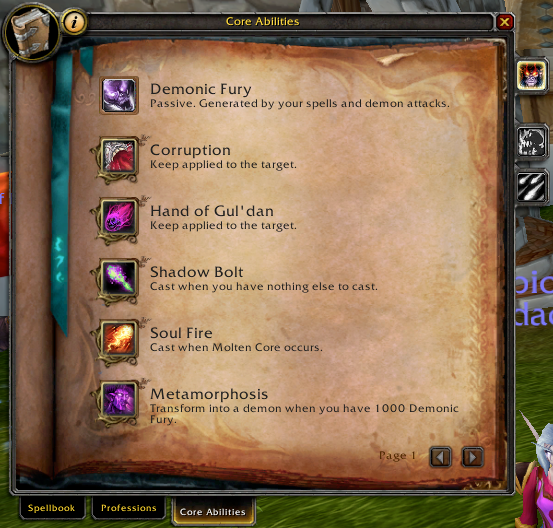 LFR/LFG coding is also pretty simple…does the subject have glyph of demon hunting? Did they que as a tank? Pretty simple coding at least in theory. GC said something about the commitment to a tanking spec should be similar but with the publicly proposed changes its actually more of a commitment than monks make. Its damn sure more commitment than a priest makes going between specs. I find it hard to believe that a few numbers passes is out of the question for beta. Especially given the decline of the class. Then again, GC isn’t known for responding to warlock issues constructively. He ususally picks on minutae and goes ostrich on the issues at hand. I wonder how much of our decline as a class is due to his handiwork or opinion in meetings? Look at locks since he joined blizzard. At the very least I wish he’d listen more to the members of the class who have hundreds of hours/days on their toons. Many of us have played our lock longer than he has been with blizzard. Ignoring that depth of player experience based on his rockstar attitude never goes well in a customer:business situation. THANK YOU for sharing all the Mists goodies for Warlocks and showcasing all the shiny, and especially for sneaking in little historical tidbits near the end that made my history geek self squeal despite not reading the mentioned source materials. Thank YOU for sticking out this series and for giving us hope for the Warlock class. I’ve read all of your “Decline and Fall” articles Cynwise and found them all interesting and enjoyable to read. As a long time Warlock main, I’ve purposely skipped the beta so all the changes will be new to me at launch, even if that leads to a steeper learning curve. I’m far more excited about playing my class for Mists than Cata. I have player Destruction PvP and I have hoped that the dispel problem would be solved in MoP, but that seames not to be the case? If I don’t have much time to play all specs and need to focus on one PvP spec, which one would you recommend as the “best” PvP spec? Destro’s PvP dispel problem right now is threefold: 1) Immo is required for Conflag, 2) Immo is required for Incinerate damage, 3) Immo offers no dispel protection but is a major source of damage. #1 and #2 are not problems in the Beta anymore – those dependencies are removed – but #3 still is. That said, Rain of Fire is now instant cast (no channel) which could be potent. I’ve always had a soft spot for warlocks in WoW but Cataclysm (after raiding a bit during 4.0 and 4.1) made me practically abandon the class after having spent years playing them at least as primary alts. After 4.0 I made my gnome warlock my new main because I simply hated my holy paladin’s new combo points (I still ended up playing it for protection). Boy did that turn out well. But at least it couldn’t get worse, or so I thought. While they mostly had the right basic ideas for change I absoutely don’t share the optimism of some people about MoP warlocks. Every implementation and change shows that whoever’s in charge of the redesign has absolutely zero understanding of the class and its current (live and beta) issues. At least, I have no other explanation for a team that actually designs a “mobility” talent with a massive cast time penalty AND a movement speed penalty. They may change a lot of stuff, and some for the better but overall warlocks lost a lot and gained very little. The current package looks like we’re just going back to the same concept that plagues warlocks right now, with different flavour. To a class that may put out the right numbers, but that’s not fun enough to play, and doesn’t compensate for its disadvantages compared to everyone else – ie., a class very few people will want to play because you can do everything it can with a different class, without the constant uphill battle. It doesn’t really matter that destruction finally gets to mostly cast direct damage spells if it’s sacrificing all flexibility and mobility to do so, with a resource system that robs the spec of practically all on-demand burst every other direct damage class has available. Just like there’s no advantage to finally getting a “non-nuke” filler for affliction if that turns the rather mobile, self-healing oriented warlock of olde into a turret with terrible mobility whose resource system depends on life tap while their self-healing got lost somewhere in the Maelstrom. A “DoT spec” warlock that throws up DoTs to enhance its main “nuke” – like a DK – isn’t necessarily more fun than one that throws up powerful DoTs and has to use a DD nuke while they tick. Don’t get me wrong though, I seriously hope things will pick up and the designers finally get a grip, but after Cataclysm and the beta experience so far I’m not holding my breath. I’d hate another expansion of shadow priests being the better affliction warlocks and mages being the better destruction warlocks in every conceivable way. Fortunately I do have alts for all classes but it would be really sad to have to abandon warlocks after 7 years. cynwise, i loved this read! you captures my feelings exactly about the class, i remember when i first played wow, with my warlock and my small imp. it was so awesome and badass (just when bc came out)now hopefully with mop that can be taken back any chance you could post cata demo macro’s you have? im changing from afflic to destro, its terribly easier(without trying i survived way better against this dk then when i was trying hardout affliction, (and im pretty good at aff, i think? ) but i feel like i could be doing more ( when i attack someone all i can think of to do is immolate, incinerate, soul fire (and coe) and hand of guldan. anway, super excited about mop, hope it hurries up and comes out! i might not being playing wow then. I was going to redirect you to my Warlock Macros page… then I realized I hadn’t put any of my Demo macros up there. Fixed! I only have a few, but I hope you find them useful! Unfortunately I have to disagree with you on this. If all you’ve done is play destro to level 20 you missed most of the game along with 2 specs. There are still plenty of discussion in the beta forums and it’s not just about numbers tuning…there are questions about general design (to which we aren’t getting any answers..not a big surprise, but). In general, I would say it’s too early to tell if ‘locks are going to work well in MoP. Don’t get me wrong, I like the graphics changes, but those fade into the background after awhile while the play issues will move to the forefront. These are signs that I would interpret as the devs running out of design ideas and relying on forum suggestions in an attempt to make some progress. This does not give me hope…I’ve been on software projects like that and that method of operation destroys design unity and usually leads to something no one is happy with. Affliction is particularly a problem here…the soul shard system is still as lame as ever, self healing is awkward (particularly for a class that directly burns health for some spells) and the idiotic initial design of MoP lifetap took way too long to be fixed (negative scaling! why did they think that was a good idea?). At the moment it doesn’t feel particularly tanky….I mean 2-way Soul Link!? really? Another spell I’ll almost never use! Maybe some of this is just numbers incredibly out of alignment (in which case we need a preliminary numbers pass right now if we are going to get anywhere) but this looks more like confused design to me. Glad to hear from you, Dejara! I was hoping you’d comment! I realize it sounds like all I did was play Destro, but that’s not the case. I leveled Destro 24-35, Warlock 1-10, Destro 10-15, Demo 10-17, Affliction 10-13 (it was boring, sorry), and played all three specs at endgame. I spent the most time with Demo, actually, because it was the strangest spec. I wanted to go back and try some Demo leveling in the 20s and 30s but ran out of time. I thought the Beta was really buggy when I tested it (now almost 2 months ago, wow, time is flying) and there was a lot of work to be done, but that – in terms of addressing the flaws of Cataclysm – there has been progress. I had to assume things like Life Tap taking 1/3rd of my health but returning like 1/6th of my mana was wrong, and that Drain Life was bugged. My lowbie Destro leveling lacked Immolate. My 85 Affliction lock kept getting Shadow Bolt instead of Malefic Grasp, 85 Destro lacked Chaos Bolt, 85 Demo was crazy with all the changes. But the ideas behind them are distinctive, unlike the current class design. Affliction is dot heavy and frantic, which I think actually will appeal to some people. Destro is rhythmic, with this buildup of Embers to unlock abilities, and of learning to time Conflags to proc Backdraft at critical times. Demo is half melee now, which – while the implementation of it is weird and unfamiliar – there’s a real distinction between it and the other specs now. And none of them feel Mage-like. The loss of self-healing in Affliction is strange. Some of it I still think is due to bugs. Some of it is numbers, and some of it is due to a design difference. Destro – I liked the 4 second CB cast time, I thought it required a lot of skill to use well, and of planning your Conflags to proc Backdraft to bring it down – but the damage had to be commensurate with the cast time and difficulty. When it was hitting for 150k at 85, it was fine. When it was hitting for 60k, it wasn’t. Demo changes every week, I don’t even think it’s the same spec I tested. I don’t know if Warlocks are going to play well in Mists. I think they have the potential to do so, but they’re very different, and implementation absolutely matters. A good design with poor execution is just as bad as a bad design with great execution. It remains to be seen what we’ll get. Thanks again for your comment, and for reading! analyzed, and replaced with new weaknesses. Except i’m not so sure about how thoroughly analyzed the old weaknesses were. And I think they may have confused strengths with weaknesses. Affliction is dot heavy and frantic, which I think actually will appeal to some people. Not the most confident statement…I not sure that will appeal to the loyal players who have been running afflocks for the last 4 years. Since wrath, locks in general and aff in particular has had an introspective play style that required a lot of forward planning and a taste for delayed gratification. I liked that and it seems odd that the spec GC declared was in the best place of the 3 specs (at the last blizzcon) would be changed so much. It not like there aren’t other classes/specs to go to if you want frantic. If their intent is to flush the current afflock player base and replace it with a wider base with different tastes, then the spec looks to be on track. It all makes me wonder if they really understand what their player base is like…I remember the comments on how they didn’t expect the achievement system to become the competitive thing it often is…which is just wacky. As a friend put it: Have they met us? Ultimately my concerns stem from the issue that if it wasn’t for the Wrath era affliction spec I wouldn’t be playing WoW at all as none other of the classes have been able to hold my interest. The beginning of Cata almost had me quit completely because of the awkwardness of the changes…I ended up doing nothing but archaeology for 6 months until various social events occurred that got me involved again. If they mess up warlocks in MoP I’m probably gone once the annual pass runs out. As my guild is now multi-game it seems unlikely that social stuff will drag me back. I don’t want to be gone, when this game is fun it’s really fun. This has been a great read, Cyn. 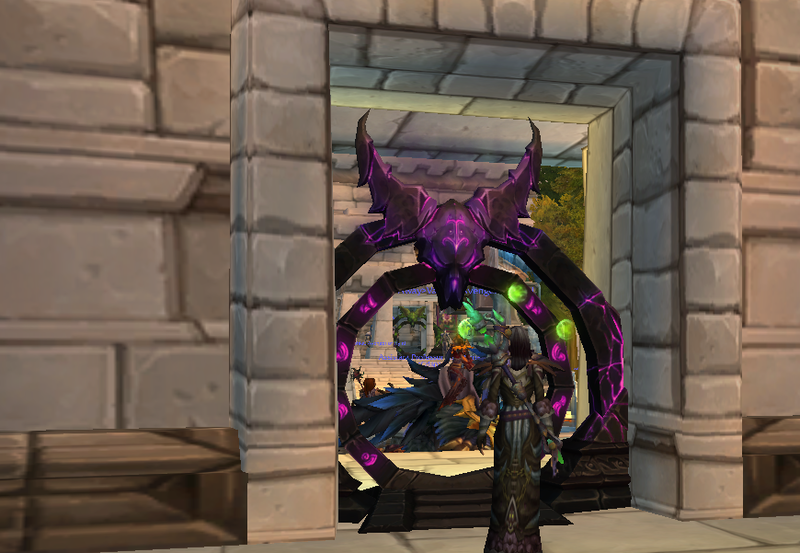 Now I don’t know whether to continue leveling my baby ‘lock through Outlands or wait for Mists! For someone who in a previous post said they didn’t want warlocks to return to Shadow Bolt/BC days, that’s exactly what we have with Mists Destruction spec. 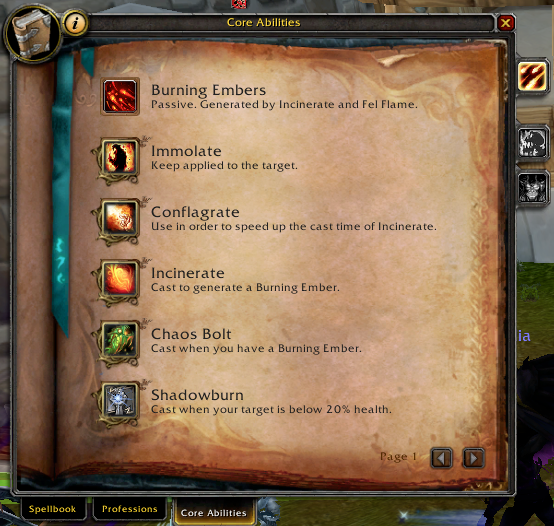 Look at those six abilities, one is passive, one is just a means to cast faster incinerates and one is an execute. You’re left with one dot, one nuke and the occasional chaos bolt as your entire rotation. Give it some more time and you’ll see the flaws in the new system too. The class is better in Mists than Cataclysm yes, but now there’s a whole host of issues to deal with and the community will get kicked back to reality after the initial shine of new wears off. I disagree that Mists Destruction is a return Shadow Destruction. I mean, I just flat out disagree with that statement. Destruction is simpler but it’s not a 2 button spec. Knowing when to use Conflag is essential; you can’t just cast it on CD and call it good enough. Rain of Fire is needed for efficient ember generation. Fel Flame is needed for movement. You have a variety of CDs you have to time to maximize DPS (Demon Soul, Doomguard). Proper casting of Chaos Bolt (with Havoc) is going to be challenging due to the cast time. The way I see it playing right now in Beta, you have 1 dot, 1 debuff, 2 nukes (CB/Incin), 3 CDs (Conflag, DS, Doomguard), 1 AoE, and a new resource system that has to be juggled. Shadow destruction was sac the pet, maybe corr, and then Shadow Bolt. While it’s true that you will be able to sacrifice your succubus again in Mists, I don’t see that they’re equivalent. I don’t disagree that there aren’t issues with the class right now in Beta. I do disagree that excessive simplicity is one of them. That’s me tanking Shadow Labs in whatever expansion that was. Warlocks have tried tanking and done it with varying success in the past. The idea of them bringing it as an intentional thing sounds great to me. During TBC we used warlock as tank in certain encounters in Kara, SSC and MH so the idea was already there, now its only small effort from Blizz required to make it a valid thing that it wouldn’t ruin class “balance”. But i guess they would have to make small change in the glyph that it increases stamina value and decreses dmg done so there wouldnt be any crying in PvP community. Thank You for this! It was a truly great lecture. Shame i found this place so late but at least it made yet another sleepless night more pleasant. I’ve started playing my ‘lock at end of vanilla and i try to keep it on top since then. Over that time i’ve observed warlocks being step by step striped out of thier utilites and everyday i hope that we will come back to our glory again – as it was during TBC ( well lets scratch the succy SB fiasco since it was just temporary ). Perosnaly i think that the main reason that people drop warlock during the leveling process was brought by introduction of hierlooms – as they had major impact on entire game and completly break balance in class on low levels. This situation generated the issue, that when warlock enters dungeon she or he feel completly useless – your dps is very low and mobs are dead long time before you can even apply your dots. Of course changes that where made to warlocks over time caused it as well, but lets be fair – it only applies to those, who played warlock earlier. Another thing is that warlocks where completly gone from lore during both WotLK and Cata…they had no part in the storyline and felt a little abandoned by dev team. I don’t think it will be any different in MoP ( lore wise, because it looks like this will be – apart of monk, a druid expansion ), but i’m happy that we where finaly noticed. I realy hope thay Blizz will come back to warlock (off)tank idea soon. In my mind it looks very simple – adding Vengeance mechanics that inceased LD power ( since it doesnt apply into PvP there shouldnt be any issue of class balance ). Looking forward for next entries!